Cucumber Recipes. Indian Cucumber Recipes. Cucumber is a specie of fruit that is used as a vegetable. It is a long cylindrical vegetable that is mostly made up of water. Even though originally from South Asia, they are now grown all over the world. Cucumbers have many varieties and are mostly eaten in 2 forms – raw and pickled. Due the high water content, they add a freshness to the dishes. Cucumber also gives a cooling effect to your body and that’s why people eat it a lot in the summers. Mumbai is known for its famous roadside sandwiches and no mumbaikar sandwich can be made without cucumber. Whether it is a Vegetable Grilled Sandwich or just a normal Open Sandwich, cucumber is usually used along with tomatoes and potatoes. Little tiny cubes of cucumber are also added to chaats like Peanut Chaat that served on the streets of Tamil Nadu to counter to the spiciness of the chilli. In southern India, curd rice is an everyday dish, but if you want to change it up a little bit, you can make Carrot and Cucumber Curd rice to give it a little more texture and taste. In my states in India it is customary to serve food with a side dish and many a times this side dish is Kachumber. This is the simplest thing to make as it only consists of a mix of chopped cucumber, onion and tomatoes with a squeeze of lemon. This kachumber can be sprinkled over fried papad to make the crunchy Masala Papad. Cucumber is an essential ingredient in many types of salads all around the world as it can easily be eaten raw without feeling too full. Cucumber can be combined with many different ingredients to make wonderful salads like a Pineapple Cucumber Salad or a Bean Sprouts and Cucumber Salad. Replace the unhealthy chips with sticks of cucumber to serve alongside Baba Ganoush and Spinach hummus and make the entire dish super healthy. Quick snacks are the best type of snacks. A few quick snacks that can be made with cucumber are the unique Rice and Cucumber Pancakes, Cucumber Pachadi and Cool Cucumber. All these take very less time to prepare and are delicious in their own way. Who knew you could turn cucumber into a soup? Cold Cucumber Soup is as refreshing as the vegetable itself and is the perfect soup for a hot summer day. A really easy, yet new, way of using the leftover paneer is to make a Paneer, Cucumber and Dill toast. This toast is made simply by combining the ingredients together and serving it on a warm toast. 1. Promotes Weight Loss – With just 16 calories and zero fat from a cup of cucumber, it certainly qualifies for a weight watcher’s diet. 2. Flushes Out Toxins – With that high water content, cucumber act a s broom for our system to sweep out harmful toxins from our body. 3. Build Immunity – Being a good source of vitamin C (8.75 mg / cup) it strengthens your immune system to keep virus and bacteria away. 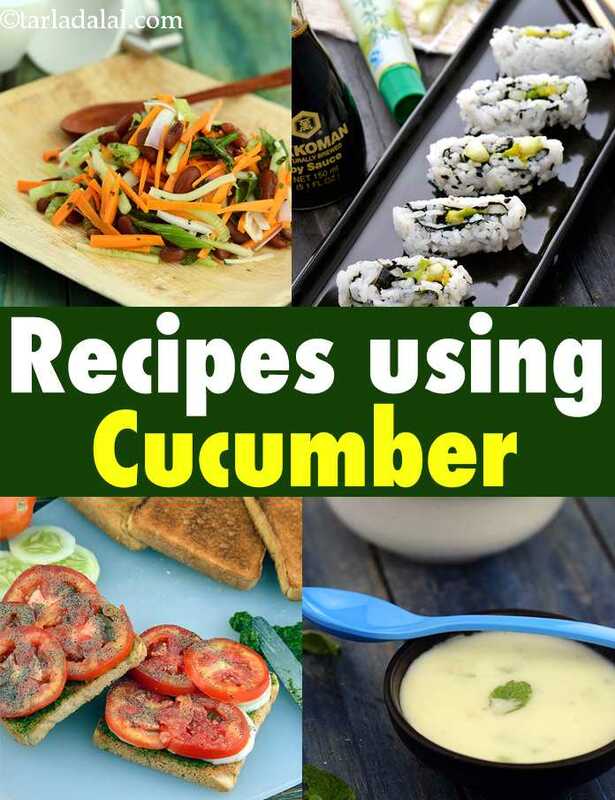 Enjoy our Cucumber Recipes. Indian Cucumber Recipes below.